I have never met a Tracie Peterson book I didn't like. She writes wonderful historical fiction. I live vicariously through her characters, and become enchanted with each new location she introduces us to! I received this book from Bethany House as part of their blogger program! If you'd like to check out more, and read an excerpt, be sure to click the title below. Emily Carver wants a home where she can put down roots instead of following her gold-hungry father from one mining camp to another. She also longs for tenderness and love, both of which are missing in her life. Yet when she realizes she’s losing her heart to the intriguing new man in camp, she fiercely fights her feelings, afraid that love will only result in disappointment and heartache. Caeden Thibault, a young geologist, comes to Montana to catalog minerals indigenous to the state. He’s a serious and guarded young man trying to escape the pain of his past. He has avoided all romantic entanglements, fearing he might become like his abusive father. But something about Emily Carver has caught his attention, something he never expected. . . .Will these two broken souls allow God to bring healing and hope to their hurting hearts? When I first started the book, I wasn't sure I'd read any stories based in Montana. 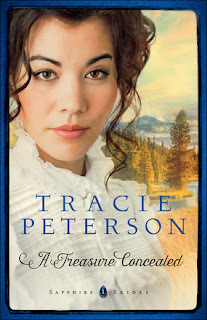 That's what I enjoy about Tracie's books. They take us to unexplored territories. If you've read mining stories before, you know how hard their life is. That's very clear from the very beginning of the story. I couldn't even imagine having lived through that time, especially as a woman like Emily. All of these men around panning for gold, hoping to strike it rich, and they're lonely. What I enjoy most about stories is when you become invested in a character emotionally. It was easy to do because you can grasp the hardship Emily has had to endure. There's frustration, excitement, sadness, and pain. Do you ever feel like shaking a character, but then realize that it would do no good. Well, not because it's just a story, but because you understand the character wouldn't listen even if they were real. I felt that way about Emily's dad. Oy! Caeden was a character I really enjoyed, although there were moments were he made me think, "He's such a dude." Then the next minute you're thinking, "Awwww he's such a great guy." Of course, we can't have a story in the wilderness without the bad guy. Kirk Davies is definitely that man! Tracie captured a lot of vileness in one man. Well, more than one man, but you'll have to read the story to find out more about that! I liked the extra characters in the book like Millie and Jake. They're the ones who, aside from the main characters, remind us that not everyone out in the mining towns were cold, disconnected, and drunk. I'm already looking forward to the next story in this series! I can never read just one. I joined Mama Kat's Wiring Workshop! I love that her Book Review prompt always shows up in time for the next book I have to review! 1. Write a blog post that ends with the line: No one ever asked me. 3. Create a recipe that incorporates mint. 4. 8 things you’d like to accomplish this Spring. 5. Share your favorite photo you posted on Instagram last month and give us the back story. 6. Show us what Spring looks like in your neck of the woods! What author do you always look forward to reading? Also thanks for mentioning the Bethany House blogger program. Something to look into. I love historical fiction--have since childhood. I know you can't judge a book by its cover, but this one would have put me off because the illustration reminds me of a Kardashian (and I avoid all things Kardashian!). So, good to know I should go deeper! Sounds exciting! And it's so funny what May said above because I totally thought the cover looked like Courtney Kardashian too!